Recent events have us thinking about immigration and a data visualization project Graphicacy designed and developed for the Center for American Progress (CAP.) After commissioning a large study on the impact of immigrants and their children on the U.S. economy, and with critical immigration related legislation pending on the Hill, CAP wanted to create dynamic, data-rich tools and narratives to share this information with policy makers, the media, academics/researchers as well as a more general audience of voting age Americans. With these end users in mind, Graphicacy created an online package including a 3 ½ minute motion graphic video and four distinct interactive information graphics woven together with short text. Asian & Pacific Islanders and Hispanic workers will represent the highest rate of change as they assume an increasingly important role in America’s job landscape. The Graphicacy team suggested representing CAP’s immigration data through a series of different “windows” that afforded views on specific key elements. We encountered some specific advantages and challenges related to the various chart types along the way. Using the metaphor of a giant oak tree to represent the American workforce, birds as immigrants, and acorns as the fruit (jobs, products, companies formed) of these immigrants, we created a visual narrative that was intended to carry the core story of immigration’s importance to the health of the U.S. economy (past, present and future) in a way that could be easily understood and appreciated. A large tree seemed appropriate for the topic given that waves of assimilated immigrants lie at the very roots of our nation’s history, a massive trunk quickly represents the scale of America’s economy and at the edges and top of this dynamic, ever changing system are the tender buds and leaves that represent future job growth requiring infusions of new talent from home and abroad. The use of metaphor, along with beautiful flowing animation effects, allowed us to present the key facts in an engaging way that we hoped would soften any predisposition to prejudice in our viewers and open them to hearing the underlying message vital to their own future financial wellbeing. Pyramid charts are good at showing the changing “shape” of a demographic group over time. Aging/maturing groups are bulging at the top and middle of the graphic (like Baby Boomers) while more youthful groups spread out wide like a Christmas tree at the bottom of the graphic (like 2nd generation Hispanics and Asian & Pacific Islanders.) In a quick glance users can tell who’s on the way in as far as numbers and influence, and who’s on the way out. 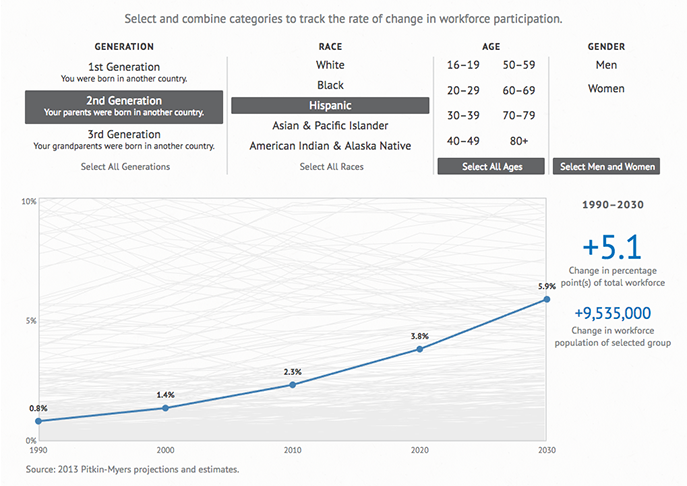 The interactive options we provided allowed users to “find themselves” in the graphic in regards to generation, race and time. We hoped that this might provide an opportunity for people to experience a more heartfelt, personal link with the information. 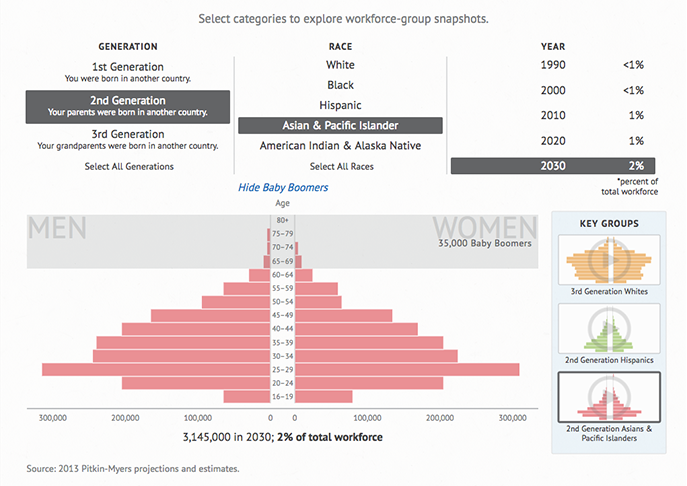 Due to the vastly different number of people in each of our demographic breakdowns, we did find a challenge around keeping each of the pyramid charts easily readable in terms of their shape (particularly for smaller groups like Asian & Pacific Islanders) while fairly representing the difference in scale. With a frequently changing x-axis, we ultimately felt the need to prominently place text below each graphic spelling out the actual numbers and percent of total workforce to help in this regard. Tree maps can be useful for comparison between broadly defined groups (like race.) Our immigration graphic of this type also afforded interesting glimpses into the relationship of sub groups (like gender within a racial group) over time. Although helpful in quickly showing larger changes, the tree maps proved to be a little more challenging to follow when changes were subtler and when users were quickly toggling through multiple category combination options. Line charts lend themselves to showing change over time. We used this information graphic to show the richness of the entire data set (a line drawn for every category combination) along with numerous filtering options to create specific views of change over time as a percentage as well as actual numbers within the overall workforce. Using the filters to select a primary line for viewing, users also had the option to mouseover other lines in the graphic to highlight for comparison. One of the challenges with this chart choice was the density of lines clustering and overlapping at the lower end of our change-in-percentage y-axis, which made direct line choice difficult where we had this collision of data. This graphic allowed us to provide historical context for immigration in America in a dynamic way. 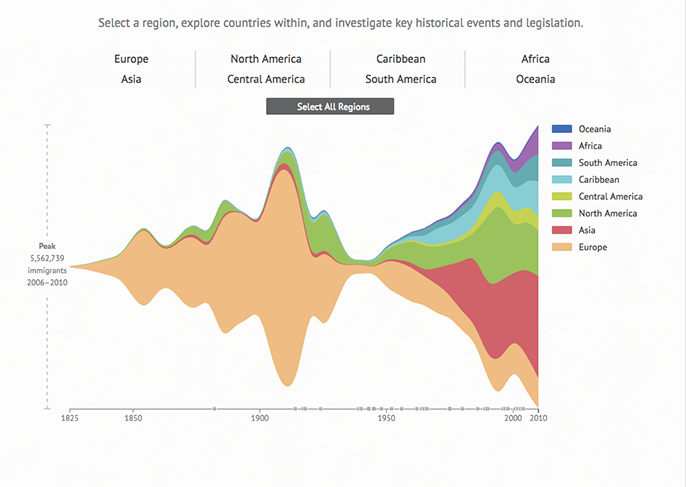 The ebb and flow of immigrants from different geographical regions and countries was visualized over the span of almost two hundred years of data against the backdrop of historical (like World War II) and legislative (like the Immigration Act of 1917 codifying the full exclusion of people from Asia) events that shaped the contours of the groups being charted. Graphicacy works with many mission-driven organizations like non-profits and think tanks. This means that we’re often juggling the commitment to integrity as data visualizers (representing data fairly and accurately) along with the understandable desire of our clients to present their point of view in a compelling way. We had a great experience in this regard with the CAP team. The data set was researched and reported by a highly respected team of academics so we knew our raw material was coming from a credible source. CAP wanted to share a story from this data that underscored the importance of current and future immigrants (and their children) to the health of America’s workforce. Immigration, even though it defines a huge part of our nation’s history and many of its success stories, remains a sometimes highly charged and volatile topic. The “other” can create strong feelings of anxiety and fear for us humans. Data (credible evidence) allowed us to ground this data-driven narrative with actual numbers, source countries, context of historical events, significant contributions, etc. and give credence to the need to support the safety, health and education of immigrants in service of a better future for us all.